Managing Facebook business Pages might seem easy, but you’ll need to work hard to attract, engage with, and retain followers on your Page. Research shows that 32 percent of users follow a brand on Facebook. That amounts to about 476 million daily users. Tapping into this group to expand a Page’s exposure takes a considerable amount of effort. Depending on the size of the business, you might need to claim any number of business Pages for it. Businesses with only one Page are easy to manage because all of the tools are readily available to you in three places: the menu beneath the Page’s profile image, the tabs on top of the Page, and the “Settings” button on the top-right corner of the Page. If you’re in charge of multiple Pages for one business, then Page-level management isn’t an efficient use of your time. Thankfully, there’s a better option available in Facebook Business Manager. You can create a parent-child Page system so that the changes you make on the parent, a.k.a. the brand Page, is reflected on all subsequent Pages related to that business. Not only does this make the management process easier on you, but it also ensures that the consumer-facing portions of the business Pages are all on message with content that is within company guidelines. To properly manage your page, make sure fill in all the right information on your listing, including adding menus, listing your products in the marketplace, and adding the right calls to action on your pages. An effective method for attracting users is to have an appealing first impression and attractive content that will make them stay on your Page. You can do this by uploading profile and cover photos that clearly tell people about the business’ offerings. You can also upload additional photos individually, as part of a slideshow, or by making a carousel. All of these image display formats can easily tell potential customers everything about a business from its products or services to how the store looks on the inside. The use of video is another form of compelling content. Altogether, Facebook users watch a total of 100 million hours of video every day. In addition to traditional videos, you can also add 360-degree video content or a live stream to better engage with Page followers. The usual, everyday post should also encourage people to interact with it. Instead of just promoting a product or service, you can use posts to elicit specific reactions or to spark a discussion among the Page’s fans. However, you shouldn’t just create general content that might appeal to someone. Instead, compile analytic data to better understand the people that regularly interact with your Page. 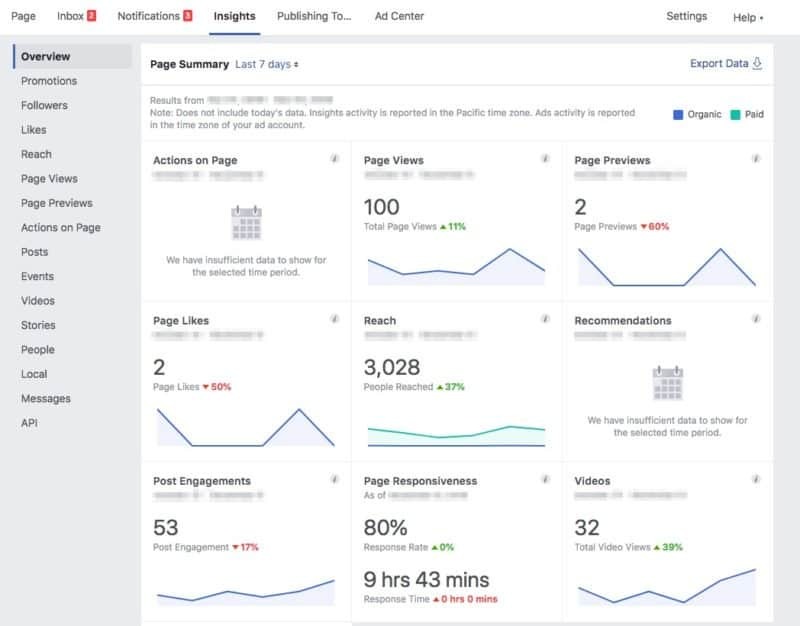 Those managing individual Pages can use the “Insights” tab at the top of the Page to measure various metrics such as reach (how many people saw and interacted with the Page), the performance of each post, and most popular actions on your Page. One of the most vital data points on Insights, however, is the People section. This provides valuable information on the people who look at your page through factors such as gender, age, and general location. By analyzing this data, you can create content that can better resonate with people of a specific age or gender. Those looking to make a local impact should also visit the Local section, which features demographic data about the people close to the business’ physical location. You’ll also see the busiest times for the business, which can help you schedule promoted content to attract new customer during these peak hours. These are all easily accessible through a Page’s Ad Center tab at the top of the screen. 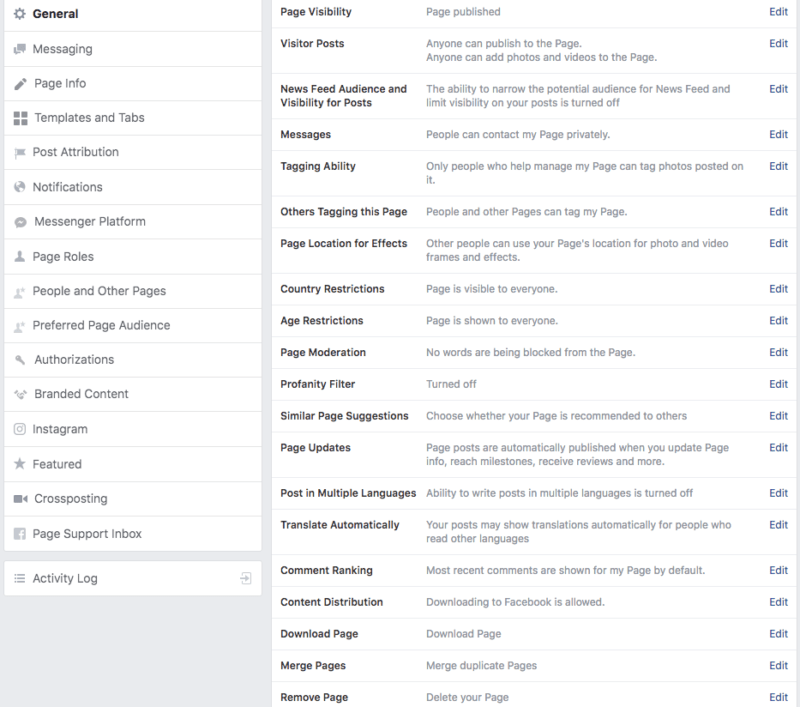 For a broader ad campaign and better analytical data, however, you might need to turn to Facebook’s Ads Manager. 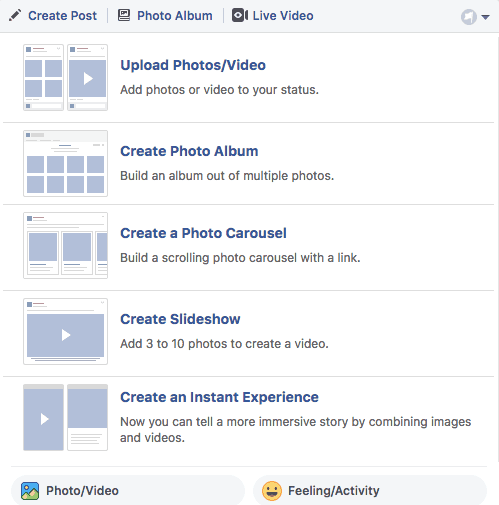 With Ads Manager, you can create photo and video ads across multiple platforms and all of the Facebook family of products and services like Messenger and Instagram. Another benefit of Ads Manager is that its features aren’t limited to one Page. Those who are in charge of multiple Pages can use Ads Manager to improve the way they manage ad campaigns across each Page. You can also use the accompanying analytics tool to better understand your target audience as well as the performance of each campaign. 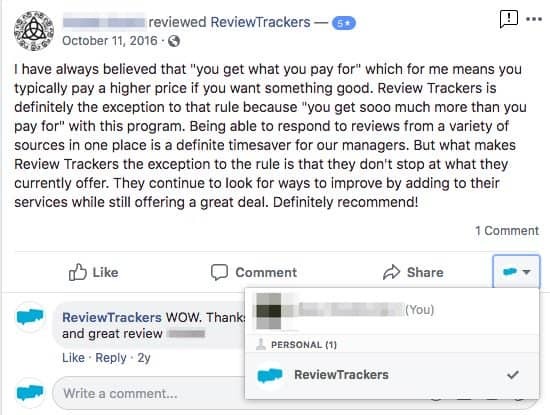 Perhaps the most important thing that determines the success of a business’ Facebook Page is the reviews left by customers. Facebook is one of the top five sites that customers check before they visit a business. In 2017, it held 19 percent of a business’ reviews, which reinforces the need for someone to actively manage user reviews. The best thing you can do with reviews and recommendations, especially the negative ones, is to respond and help resolve any issues. By responding you show that a business care about every piece of feedback whether it’s positive or negative. In addition, you can win over 45 percent of potential customers with a proper response to a review.